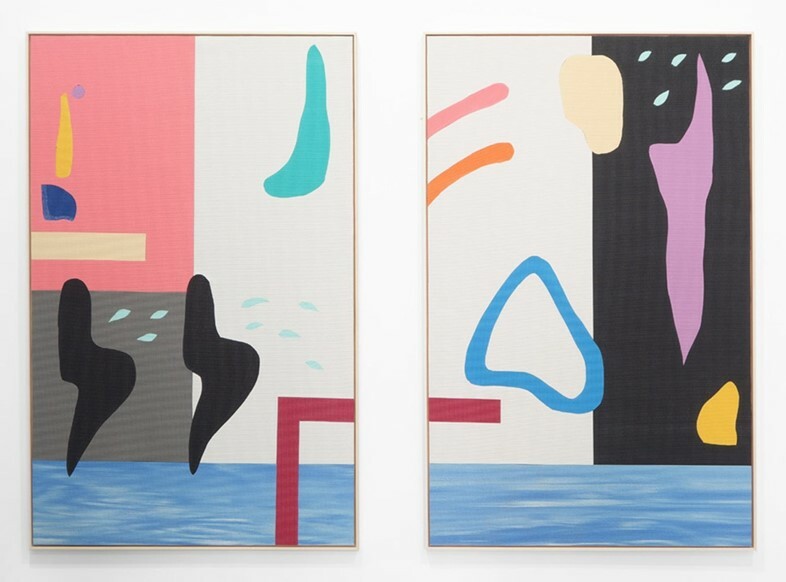 From a distance, the work of Baltimore-based artist Alex Ebstein evokes that same sense of mystery and joy as looking at one of Matisse’s exuberant cut-outs. 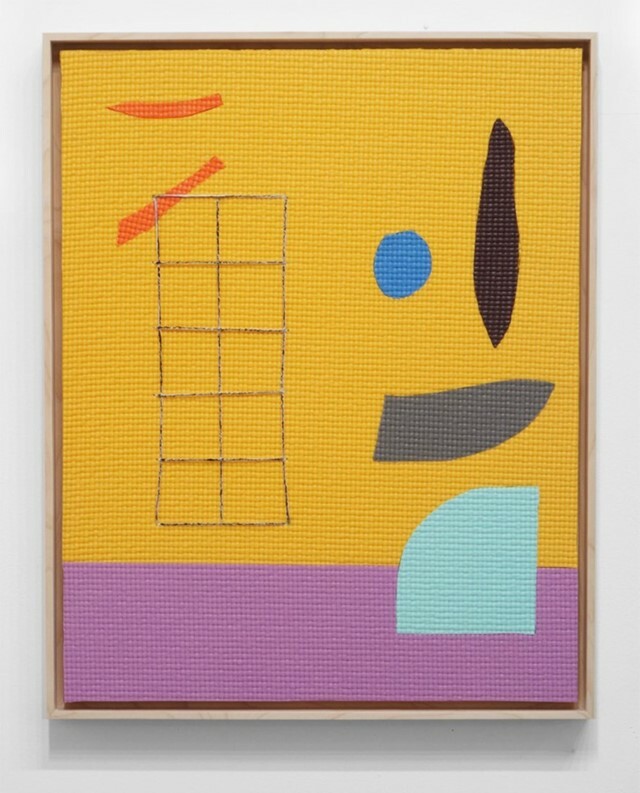 She smoothly, yet also crudely and with childlike charm, slices and re-arranges colourful, vaguely organic shapes into evocative new compositions. A closer look at Ebstein’s fragmented collages and they begin to feel a lot more intimate and familiar than the serendipitous curves of iconic modernist Matisse, however, not least because Alex’s unconventional artistic material of choice is yoga mats. The unmistakable, grid-like texture of the sports mats immediately inspires a sensory response and gives Ebstein’s work a uniquely 21st century setting and context. Her titles also prove intriguing: Haunted Memories, Dawn Gathering and Texting in Different Time Zones are dream-like and hint at elusive narratives. Anyone who has spent any time doing yoga – with palms pressed firmly into a mat while arching into downward facing dog – will know the speckled texture well. The combination of definitive abstraction and familiarity is both comforting and thought-provoking, and invites you to draw intriguing parallels. As a yoga mat is designed to the scale of a person and is used to stretch and loosen the body, the artwork is intimately connected to physical contours: by rearranging the fragments, Ebstein’s artworks address ideas of body obsession, specifically the idea of sculpting, malleability, toning and “getting in shape”. They reference modern art’s premise of abstraction’s power of transcendence, and contemporary culture’s fixation with achieving physical and spiritual welfare. If you’re in Rome this month, you can see Ebstein’s work on display at Frutta Gallery. Here the artist talks intimately about her creative process. Stefano Calligaro and Alex Ebstein's work is on display at Rome's Frutta Gallery from March 10 until April 16, 2016.